Do you need a cleanroom? The need for one can seem overwhelming. If you’re considering having one built Panel Built is here to help you. 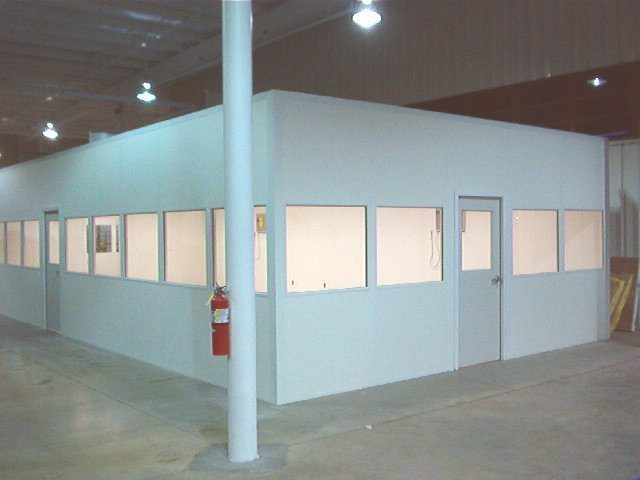 We provide the building of cheap modular cleanrooms at an affordable price! Our cleanrooms have all the features you need like positive pressure, air flow, relative humidity, filter efficiency, HEPA filters, CFM filter, ante room, pressurized plenum, return air, pre-filter, and make-up air. Do Panel Built Cleanrooms Meet In-Plant Modular Office Systems? We get this quation asked a lot. Why, indeed they do! Here at Panel Built we take away the confusion to make sure you’re covered so you have everything you need when you received your cleanroom. The doors, panels, and windows for the common in-plant modular office system meets Class 100,000, Class 10,000, and Class 1000 needs. Our building experts known exactly how to combine the wall system with the appropriate cleanroom component to insure your cleanroom meets the strictest requirements possible. So, when Panel Built can have your cleanroom built so fast and swiftly. What does this mean for you? Are the cleanrooms built by Panel Built just as good as their competitions? Well yes, as a matter of fact they are! Here at Panel Built we work closely with our suppliers to guarantee you get exactly what you need. We understand not everyone has the exact same specifications and Panel Built is always happy to work with you to make sure you get exactly what you want. Cleanrooms built by Panel built are built to incorporate the return air chase system. We do this by utilizing the room in the wall cavity in order to make of much use of the space as efficiently as possible. This also to make sure the cleanroom is properly sized in order to use as much available space as possible. By doing this we are able to eliminate the chase walls and expensive duct work that is often associate with cleanrooms systems. This translates into a a final product that is easier to install, more attractive, and top of which less expensive. We know cleanrooms don’t always look the prettiest when they’re installed. It’s hard to make them look nice, neat, and attractive so they don’t become an eyesore. Cleanrooms can also take up a lot of space when you’re in desperate need of one. At Panel Built we know keeping it nice and neat can be a hassle. This is why we put a lot off effort and focus into utilizing the space for the cleanroom as much as possible. It’s the main reason we use the wall space to contain the hidden return air chase system. We also work closely with our suppliers to guarantee you get only the highest quality cleanroom you need as swell. We understand the need for specialty components such as sealed and gasketed light fixtures, HEPA fan filter units, and cleanroom drop ceilings. No matter what it is we will continue to meet our industry leading delivery times so you never have to wait to long for your cleanroom! Don’t need as much as we got? Don’t worry about it! Here at Panel Built we can supply as little or as much as you need. No reason to second guess how much you’re going to need in advance. We’re always ready to deliver when you need us too! We know when you have a busy schedule you don’t have time to wait around for components to arrive. Here at Panel Built we don’t make you wait longer than necessary. You can rest assured we will always deliver in timely manner. Do you already have a mechanical contractor on hand? We can work with that! Here at Panel Built will make sure your contractor is supplied with the important information so he can properly design and supply your HVAC system. If you don’t have a mechanical contractor that’s not a problem for us either. We can install, specify, and supply the ideal system you want. Panel Built cares about the customers and we understand sometimes you need a little extra hope. We make sure to have area covered and have thought of everything to make the process go as smoothly as possible. Panel Built was first founded in 1995 by the brothers Mike and Pat Kiernan. It started with the construction of pre-manufactured buildings. Today, we here at Panel Built offer a whole line of exterior buildings, custom modular offices, pre-assembled buildings, and mezzanines. We like to make sure our buildings are of the highest quality and meet industry standards. Each of our multiple product lines is produced on site first with our two state of the art manufacturing facilities. When it comes to each of our products we offer “A Better Way to Create Space” for all of your building projects wants and needs. Our mission here at Panel Built Inc. is to be a world class manufacturer of steel mezzanines, modular offices, and pre-fabricated buildings. We believe in complete customer satisfaction. We take pride in being able to listen closely to our client’s space needs and being able to provide creative solutions within the budget the client has. Our employee, customer, and dealer relationships are the foundations of our company. We strive to provide only the best postie, safe, and rewarding work environment so we can continue to enrich the lives of our employees and their families.